Come on Betty! You're such a tease! I'll never forget the day my husband and I came across the Gluten Free Asian Fried Rice Chicken Helper by Hamburger Helper. We were making homemade sushi and egg drop soup and my husband decided he wanted pork fried rice as well. I sighed knowing I had no desire, not to mention no day old rice, to make the homemade version and that meant he would probably stop at the Chinese place on the way home to pick some up. But instead a lightbulb lit up over his head, he grabbed my hand and led me to the Hamburger Helper aisle in the grocery store. He grabbed the Gluten Free Chicken Helper and said, "We'll make this!" Still bummed that I wouldn't be eating fried rice, he made me look a bit closer at the box. "It's gluten-free!" I squealed (yes, squealed). He was soooooo excited. Finally a quick and easy, and quite nostalgic, meal he could make AND share with me. For a couple that eats little processed food and cooks every meal, this was AWESOME. Fast forward to today. 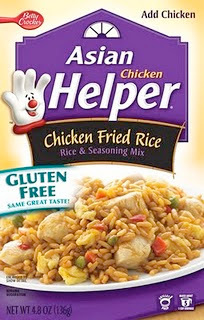 I come home from my women's business group and discover that my husband is making the GF Asian Helper for dinner (he stocked up at the last buy-one-get-one-free sale at Harris Teeter). We're sitting on the sofa watching Monday Night Football and enjoying our delicious Helper when I mention that Hamburger Helper makes three gluten free flavors, though I don't know what they are. "Google them," he says. So I do. And what do I find?! Three blog posts about how those very same three flavors (Beef Fried Rice, Chicken Fried Rice and Cheesy Hashbrowns) will NO LONGER BE GLUTEN FREE!! What?!! This can't be true. This product was only introduced to the market a year ago, how could they be pulling it already? I delved into the blog posts, comments and reviews. The gluten free community seemed to like the product while the wheat-eaters did not. They complained about hard/mushy rice and the smell. Let me tell you wheat-eaters something just to get it off my chest. Rice does NOT contain gluten. You simply cooked it incorrectly. My husband (a wheat-eater) makes both regular and gluten free Hamburger Helper products for himself and it comes out perfectly every time. As for the smell, it did not disagree with us. But alas, this is not why they are pulling the GF versions off the shelves. In fact, they are not changing the ingredients or recipes at all. General Mills is changing the manufacturing plants where Helper is made and can no longer guarantee that there won't be any cross contamination. This does not make sense to me. Granted, I am not a multi-million dollar corporation owner, but why would a company who's made such a huge impact in the gluten-free community switch manufacturers when it requires them to pull back some of their amazing and popular products? I mean, their reason for creating gluten-free products goes all the way to the top! What's next, the Gluten Free Bisquick? Betty Crocker's delicious, tastes like the real thing brownies? I can only help that Betty will find a way to bring back the GF Helpers soon. P.S. At the time of this post there were still Gluten Free Helpers on the shelves of my local grocery stores. The boxes may be mixed as they make the transition so make sure to READ LABELS if you try to stock up before it's gone.